What Do You Want to Know About the 2018 Nissan GT-R? Friends, as your hardworking Jalopnik EIC, I’ve driven some cars. At this point, everything from a Ford Model A to a Bugatti Veyron. Hell, I’ve even been behind the wheel of a Lancia Delta Integrale, and you could probably fit all the Americans who’ve done that into a school bus. But I’ve had one bizarre, inexplicable, glaring hole in my car resume: the Nissan GT-R. Until right now. I don’t know how, exactly, I’ve never gotten the chance to drive a GT-R, especially considering it’s been around since 2007 (!!!) now. It just never happened for me. It’s weird! But I’m about to fix that, as the Nissan folks have loaned us this silver 2018 GT-R for the next week. What do you want to know about it? 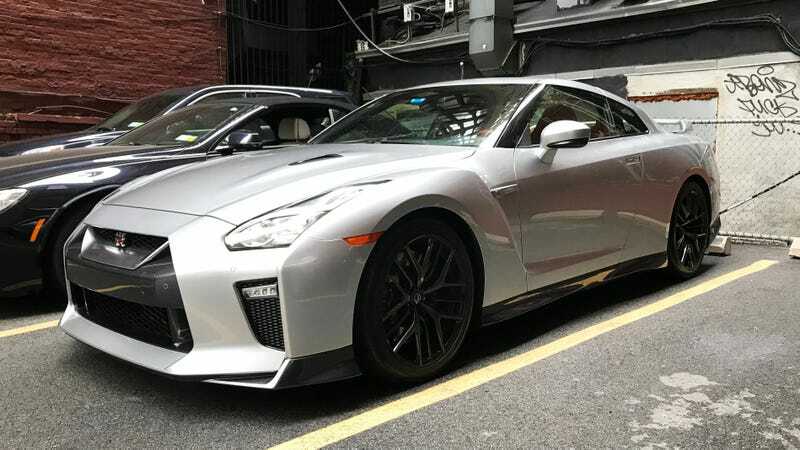 The thing about the GT-R is that even though it’s old as hell, weighs as much as an apartment complex and looks about as sleek, it’s still fast. Crazy fast. Zero to 60 mph in 2.9 seconds with a 195 mph top speed, fast. It’s one of the quickest street cars in the world, bar none. And while it’s not cheap—our tester stickers in at a hair under $120,000—its 3.8-liter, 565 horsepower twin-turbo V6 is potent enough to waste most of the sports cars that have come and gone since it was new. It deserves some respect for that. But numbers on paper can only tell us so much. I want to know how it really feels to drive and live with for a week, and I know you do too. Ask me stuff about it. I’m doing this for you, after all.